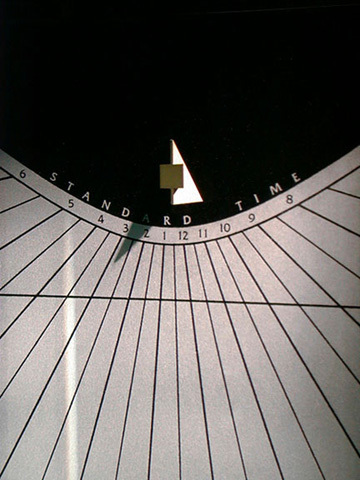 Close-up view of the shadow field of a south facing Spectra showing hourlines, solstice and equinox lines, brass shadowcaster and time shadow. Southern facing Spectra sundials generally tell time during the mid-day hours, though in the Winter (northern latitudes) they will tell time all day long. The shadow indicates that the time is about 2:50 pm. A special date line can also be added to most Spectra shadowfields (at no extra charge) to commemorate a certain day such as an anniversary or birthday. On that day of the year the tip of the shadow will ride that special line during the course of the day. Contact us directly with any ideas for personalizing your Spectra sundial.